We offer goal post with net sleeves, which have heavy duty net attached to it and are suitable to be used in different weather. 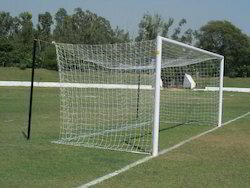 Our goalpost is made of quality material and is highly durable and sturdy in construct. Made of steel, Powder Coated for durability & comes in 2 varients 1.5" & 2" steel tubes. We are a dependable manufacturer, exporter and supplier of a comprehensive assortment of Rugby Post Protectors which is use at international stadiums to grass roots rugby pitches, the offered post protectors is made up of top grade material by our competent workforce. This post protectors is widely admired for its durability. The company has firmly established itself as a major Exporter & Supplier of Soccer Goal Post. The Soccer Goal Posts, which the company is offering, are long lasting products procured from the trusted vendors. - An ultimate training rebounder for goalkeepers. 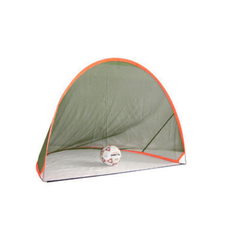 - This Goalie Rebounder is made of 25 mm steel tube & powder coated for durability. - Easy to hold with two hands. - Comes completely assembled with frame, elastic net & hardware. - It allows players to practise precision shooting and aiming and is popular amongst coaches and players alike.